^^Apparently, that review fell on deaf ears, as Horizon performed exceptionally well on the UK chart. 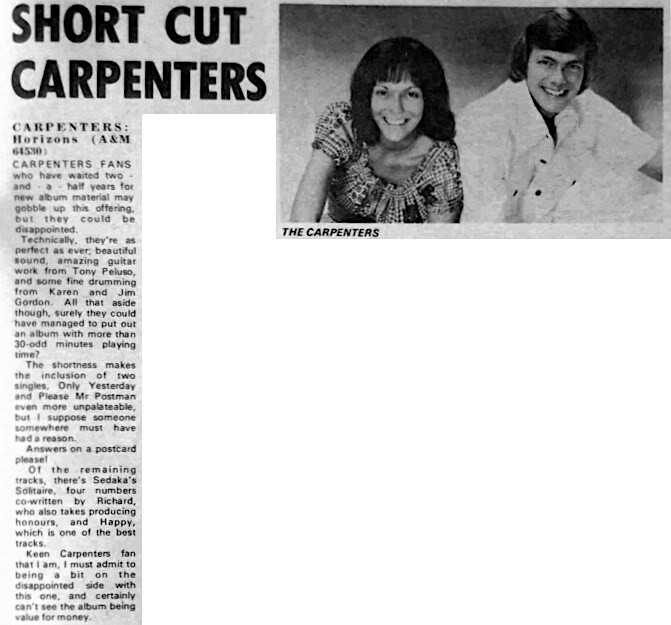 I wonder if that reviewer felt the same regards the Tan-Carpenters- LP ? Timing at 29 minutes, 36 sec. is not the same as the single version--the reviewer fails to note the difference. "value for the money," I do not know how the reviewer defines that term.... ! Horizon album sounds incredible. I rarely--if ever--think of its brevity. "To have that voice on A&M records was really a thrill.."
I wonder if they ever told Karen that. ^^You make an excellent point ! I always interpreted that as meaning Jerry Moss didn’t have a lot of time for Richard. "A Hiroshima TV Presentation 1975"
So I would have to imagine that had this tour not been cancelled that many of the concerts in Japan would have been filmed for broadcast on TV. It's also possible that it could have been made into a VHS tape or DVD like what happen with Live at Budokan. It's also very possible that since this tour was to promote the album that we would have live versions of many of the songs off the Horizon album. Can you imagine? See here for all 6 pics.